Sunday. 4pm ET. Week 33… Decision Day. All 20 MLS teams get under way at the same time this weekend as the regular season reaches its climax, and here’s a closer look at the PRO officials in action. The Conference leaders – FC Dallas in the West and New York Red Bulls in the East – are both on the road this Sunday, and Chris Penso will referee the former, who travel to LA Galaxy. Penso refereed the All-Star game earlier in the year, and you can read the 34-year-old’s thoughts on what was a memorable week for him below. Kevin Stott, 2010 Referee of the Year, takes charge of the Red Bulls’ trip to Philadelphia Union. He’s joined by a two-time AR of the Year, Kermit Quisenberry, and Craig Lowry who has been on flag duty in four MLS Cups during his distinguished career. Baldomero Toledo refereed that showpiece, and he’s on duty for Seattle Sounders versus Real Salt Lake, with Frank Anderson among his crew. Anderson, along with twin brother Ian, lead the way with this weekend seeing the pair earn assignment number 23 this year. That will also be the case for the reigning Referee of the Year, Alan Kelly. The Irishman has been assigned to Vancouver Whitecaps against Portland Timbers, while Fotis Bazakos will join him in Canada – he officiates Toronto FC versus Chicago Fire. Alongside Bazakos is Canadian AR Daniel Belleau, who has taken the flag for three Canadian Championship Finals, the 2012 MLS Cup and last year’s CONCACAF Gold Cup so far in his career. Brian Poeschel and Silviu Petrescu complete the crew. Drew Fischer is back in the middle for Sporting Kansas City versus San Jose Earthquakes, while AR Cameron Blanchard is part of the crew when Orlando City host D.C. United. The pair combined to great effect during Seattle Sounders versus Houston Dynamo last week – something looked at in great detail in the latest Play of the Week by PRO’s Training and Development Manager Paul Rejer. Corey Parker, one of last year’s MLS Cup ARs – and the AR of the Year – supports Jose Carlos Rivero for New York City’s clash with Columbus Crew. Eric Weisbrod, an AR in last year’s USL Final, joins the team of officials at Yankee Stadium. Elsewhere, New England Revolution host Montreal Impact under the watchful of eye of Hilario Grajeda, while Colorado Rapids take on Houston with Ismail Elfath the man in the middle. 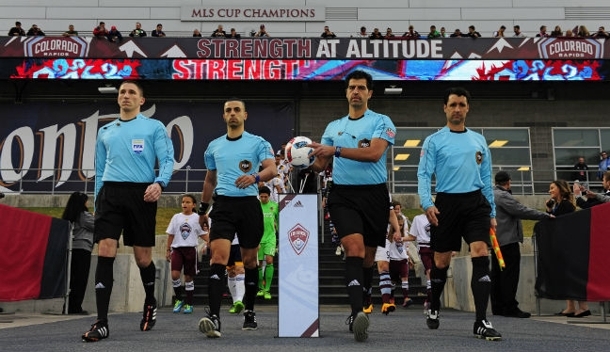 Elfath, MLS All-Star referee last year, has also been busy in the USL this season getting to grips with the use of VAR technology – and you can read his thoughts on the experiment below.